South Croydon railway station is on the mainline from London’s Victoria and London Bridge stations and the south coast. Frequent trains call at South Croydon from East Croydon and Redhill. 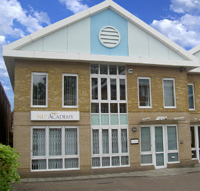 The NLP Academy is about five minutes walk from the station. From the main station entrance, head for the spire of St Peter’s church. Turn left at the church and walk down the hill to the mini roundabout. Bear left into Selsdon Road and then take the first right (Drovers Road). Turn left at the end and The Pavillions is just a few yards along on your left. The NLP Academy is at the far side of the courtyard. From the M25 turn off at junction 7, taking the M23 north to Croydon. Where the M23 ends keep straight on to the A23. Stay on this road, it becomes the A235 at Purley Cross, for a little over 6.5miles. When you have passed the Red Deer, a large pub on your right, look for “the Pavillions” a modern office complex about half a mile further on your right, opposite Whitgift School. If you require parking there is a car park in spicers yard just north of our Academy, also there is off-street parking on both Drovers and Upland road, this is £4.20 for 4 hours. You can also park at South Croydon station £4 for the day. From Croydon take the A235 Brighton Road south. “The Pavillions” is on the left just after the Swan & Sugar Loaf pub, opposite Whitgift School. Train: You can take a London Victoria or London Bridge service from Gatwick to East Croydon, change at East Croydon on to the Caterham service to South Croydon. Journey time is around 35 mins. 3) Take the Heathrow Express directly into Paddington then take the circle line to Victoria. Get an overland train from Victoria into East Croydon. Est Journey time 1hour. 3) Get an overland train from East Croydon into Victoria. Then take the circle line into Paddington and take the Heathrow Express directly into Heathrow. Est Journey time 1hour.